There's a lucrative reason General Electric isn't turning its back on light bulbs completely. When Jeffrey Immelt decided to sell GE Lighting earlier this month, the General Electric Co. (GE - Get Report) CEO made it clear that the manufacturer wasn't abandoning the illumination business altogether. While the division that made consumer light bulbs -- the product most closely linked to founder Thomas Edison -- will be offered to one or more buyers, Boston-based GE will keep producing the professional lighting systems it markets under the Current brand. The logic behind the decision is rooted in the company's strategy. Current, which specializes in LED lamps as well as computer systems that control them and are capable of monitoring and optimizing energy usage, epitomizes the retiring CEO's effort to reshape GE from a sprawling conglomerate with unrelated businesses to a lean digital manufacturer. It's also a growing business, with revenue up 3% in the three months through January and an announcement today that work has begun on adding Current's new Allsites energy management system to some 4,500 of banking giant JPMorgan Chase's (JPM - Get Report) U.S. branches. 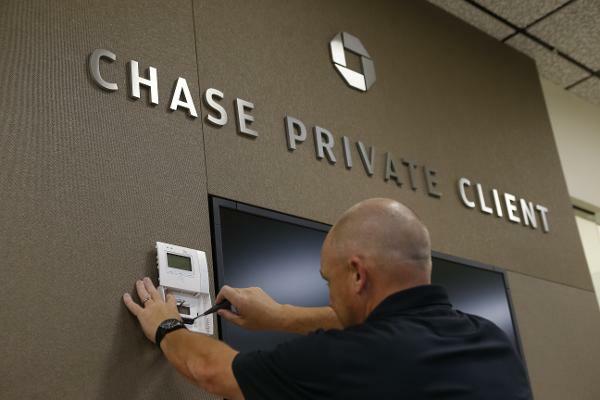 AllSites, an application created in the Predix platform that GE built to do for factories what Apple's iOS and Google's Android did for smartphones -- will use sensors, software and lighting controls to curb electricity and gas usage at Chase branches by 15%, saving a couple hundred million dollars over 10 years. "We're going to have better control over our lighting, air conditioning and heating so that we're not running it all day and night," Mike Norton, the head of property management for the bank's real estate, said in a telephone interview. "We're going to have periods of time when we shut it down. That'll help us be more economically efficient." The installation is the second phase of a project that began in early 2016 with the installation of LED, or light-emitting diode systems, in the bank's branches. Workers have upgraded the lighting in about 2,500 sites so far. In addition to improving energy efficiency, which will reduce branch operating costs, the LED systems make the offices more appealing to customers by eliminating burned-out bulbs or the variations between color hues when different types of bulbs are installed, Norton added. "With LED, you get a consistent color and a consistent feel for our brand," he said. "The longevity of LED is much longer. There's a 10-year life span." What's being added to the LED systems now is, in essence, its brains: a wireless network that's capable of not only monitoring lighting but tracking energy and water consumption, powering equipment on and off if desired, and alerting bank personnel to problems. That will reduce service calls for air-conditioning repairs and sprinkler leaks, for example, and lift some of the workload from employees, "who traditionally would have to show up in the morning and pre-cool their buildings" to be ready for customers, Norton added. The "digital backbone" that GE will install over the next 18 months "allows us to really expand beyond just energy," said Garrett Miller, Current's general manager for digital platforms. "It allows us the optionality to go and deliver additional benefits to those customers." For clients, one of the most attractive pieces of GE's Predix is that it's an open, unified system, Maryrose Sylvester, Current's president, said in a telephone interview. "Once they put the platform in, we can put other apps on top of it," she explained. "Customers are hungry for productivity. They're hungry to be smarter so they can take action in real time, but they don't want the hassle of separate systems. They want one, open platform." EXCLUSIVE LOOK INSIDE: General Electric is a holding in Jim Cramer's Action Alerts PLUS charitable trust portfolio. Want to be alerted before Cramer and the AAP team buy or sell the stock? Learn more now.